Smoking in cold temperatures presents several challenges. When operating a charcoal or wood-fired backyard smoker, the weather is always something you need pay very close attention to. When temperatures are very low, you need to be especially careful. Reaching and maintaining ideal smoking temperatures can be difficult at best, and it’s very hard if the wind is blowing. Metal smokers are particularly challenging because the metal conducts the heat quickly away from the cooking chamber. The first thing to consider is the temperature difference. On a nice warm summer day, you might find that your smoker—sitting in the sun—has an internal temperature around 100 F without a fire in it. If your target temperature is 225 F, you need a fire that will increase in smoker temperature by 125 F. If on the other hand, it is a cold and overcast day, the internal temperature of your smoker could be 35 F, meaning you need to increase the temperature by 190 F. This is nearly twice the temperature difference. This means warm weather makes for better temperature control and a hotter fire with more fuel. Now we need to think about the wind. The most important thing about wind is the direction relative to your smoker. Some smokers, like the large offset smokers, have a definite airflow path. Air comes into the smoker through the firebox and moves across the cooking chamber and out the stack. If the wind is blowing in this direction, the increased airflow will burn your fuel faster and can cause high-temperature spikes. This means you’ll need to keep the vents closed more than normal. If the wind is going in the other direction, it can stop the airflow entirely and keep the heat out of your cooking chamber. 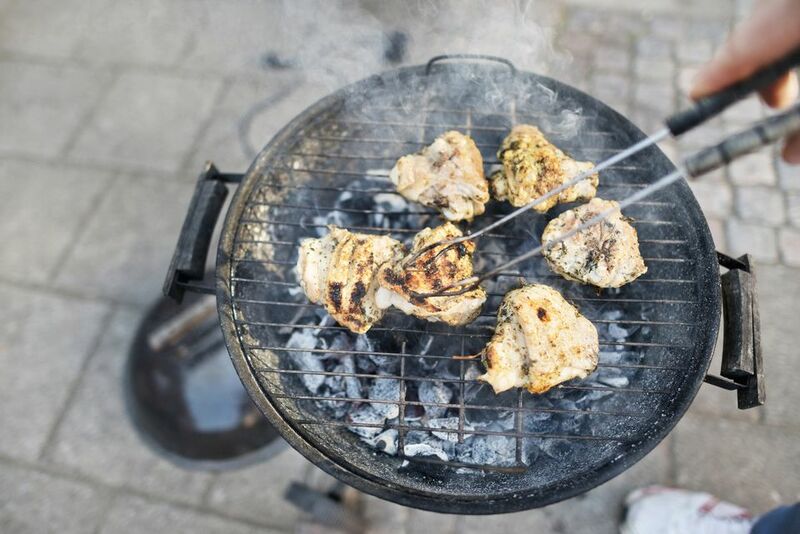 It is best to let the wind add to the airflow and not stop it; so if possible, position your smoker so that the wind is blowing in the direction of the natural smoker airflow. It is very important to keep an eye on the wind as well as your smoking temperature. Of course, it's very difficult to smoke in heavy rain, but cold weather also brings light rain or snow. When water hits your smoker, it is going to evaporate, and evaporation pulls heat from your smoker. If during the course of a smoke, you find some rain or snow falling, it’s time to open up the vents and bring up the temperature to offset this heat loss. Keep a close eye on it and you should be okay. The ideal smoking environment is a warm and calm one. Anything you can do to create this environment will help you maintain good temperatures and have a successful barbecue. By positioning your smoker in a sheltered (but not enclosed) space, you can reduce the effects of wind. Some people have gone so far as to build windbreaks to set around their smokers to keep the wind away. This can be a good strategy, but make sure you are not putting flammable material in close proximity to your smoker. The wind can make sparks jump a good distance. People also sometimes use insulation materials to hold the heat in their smokers. This is OK as long as you are using flame-resistant materials. You can typically find fire-resistant insulation materials at your local hardware store. Furnace insulation and certain water heater blankets work great. Cut it to fit around your smoker, and you can hold in a great deal of the heat generated. Just make sure you don't cover up the vents. If the weather is bad, you don't have to resist a good barbecue. You can pull 20-hour smokes in sub-zero temperatures with great success. The secret to operating a charcoal or wood-burning smoker is vigilance. When the weather is bad, you have to be extra vigilant, but it is certainly doable. Just because the thermometer has dropped, doesn't mean you need to forget the smoker. After all, the best cure for the winter blues is a great barbecue.